Bill Barclay isn’t shy about performing Shakespeare. But his unsuspecting audience looked a tad confused as he stalked, shirtless, through the hot baths of Leukerbad in the Swiss Alps, proclaiming text from A Midsummer Night’s Dream. That event was in service of a sometimes wacky, always enthusiastic crusade dubbed Shakespeare Aloud. Barclay has set out to read the Bard’s entire canon—out loud, in public—from various spots around the world. And it’s all chronicled online. Confrontations with authority figures add a touch of the outlaw spirit, but it’s more satisfying when thematic resonances—sometimes planned, sometimes accidental—emerge. Barclay spoke the assassination scene from Julius Caesar at the Lincoln Memorial. He tossed off the “tennis balls” bit from Henry V, wherein the young king receives a mocking gift, from the stands of a beach volleyball match at the 2012 London Olympic Games. The exchange between Romeo and Juliet about “two blushing pilgrims” in a “holy shrine” served as serenade to the adjacent statues of Babe Ruth and Ted Williams at the Baseball Hall of Fame. The location scouting is helped by the fact Barclay’s work requires a lot of travel. Installed last year as director of music at Shakespeare’s Globe Theatre in London, he accompanied an international touring production of Hamlet for which he’d written music. 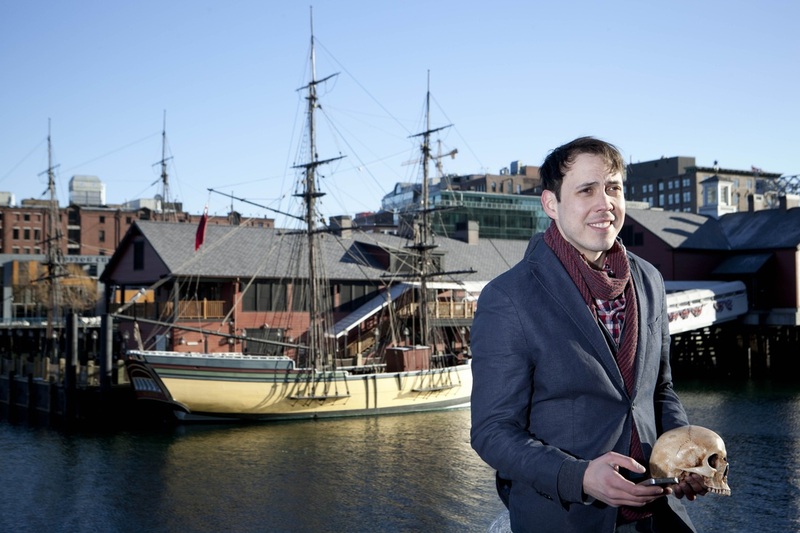 In late 2012, he returned for two months to Boston to appear in Two Gentlemen of Verona at Actors’ Shakespeare Project, where he’d directed a surprise-hit production of Timon of Athens in 2010. He’s been in the acting company of the Mercury Theatre Company in Colchester, England, and spent 10 seasons wearing various hats (including that of resident music director) at Shakespeare & Company in Lenox, Mass., where he had his actor training and was originally bit by the Bard bug. Its spirit is playful, but Shakespeare Aloud began as an academic inquiry—research for a book on the evolution of Shakespeare’s use of song and the musicality of his verse—then emerged as a massive project of its own.